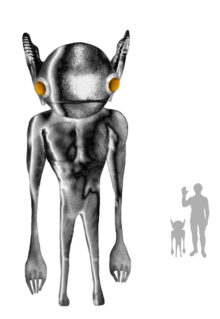 An artist's impression of "Hopkinsville Goblin". The Kelly–Hopkinsville encounter (a.k.a. Hopkinsville Goblins Case, Kelly Green Men Case) was a claimed close encounter with extraterrestrial beings in 1955 near Kelly and Hopkinsville in Christian County, Kentucky, United States. UFOlogists regard it as one of the most significant and well-documented cases in the history of UFO incidents, while skeptics say the reports were due to "the effects of excitement" and misidentification of natural phenomena such as meteors and owls. Psychologists have used the alleged incident as an academic example of pseudoscience to help students distinguish truth from fiction. Residents of the farmhouse included Glennie Lankford, her children, Lonnie, Charlton, and Mary, two sons from a previous marriage, Elmer "Lucky" Sutton, John Charley "J.C." Sutton, and their respective wives, Vera and Alene, Alene's brother O.P. Baker, and Billy Ray Taylor and his wife June. Both the Taylors, "Lucky" and Vera Sutton were reportedly itinerant carnival workers that were visiting the farmhouse. The next day, neighbors told two officers that the families had "packed up and left" after claiming "the creatures had returned about 3:30 in the morning". The family's claims received widespread coverage in local and national press. Early articles did not refer to "little green men", the color was later added to some newspaper stories. Estimates of the size of the alleged creatures varied from two feet to four feet, and details such as "large pointed ears, clawlike hands, eyes that glowed yellow and spindly legs" later appeared in various media. Psychologists Rodney Schmaltz and Scott Lilienfeld cite the alleged incident as an example of pseudoscience and an "extraordinary claim" to help students develop critical thinking skills. It is plausible, if not likely, that the 'aliens' were Great Horned Owls, and there is some evidence that the eyewitnesses may have been intoxicated during the 'alien attack' (Nickell, 2006). Committee for Skeptical Inquiry member and skeptic Joe Nickell notes that the family could have misidentified "eagle owls" or great horned owls, which are nocturnal, fly silently, have yellow eyes, and aggressively defend their nests. According to Nickell, meteor sightings also occurred at the time that could explain Billy Ray Taylor's claim that he saw "a bright light streak across the sky and disappear beyond a tree line some distance from the house". According to author Brian Dunning, "there are simply too many similarities between the creatures reported by the families and an aggressive pair of the local Great Horned Owls, which do stand about two-thirds of a meter tall". French ufologist Renaud Leclet also argued in a publication that the explanation of the case is great horned owls. Some UFOlogists compared the alleged creatures to gremlins, which have since often been referred to as the "Hopkinsville Goblins" in popular culture. UFOlogist Allan Hendry wrote "[t]his case is distinguished by its duration and also by the number of witnesses involved." Project Blue Book listed the case as a hoax with no further comment. The Kelly-Hopkinsville sighting is at the origin of the popularization of the words "little green men" (prior to this sighting, flying saucer occupants were called "little men"; "little green men" were limited to the science-fiction culture, in particular in Mack Reynolds' The Case for the Little Green Men (1951) and in Fredric Brown's Martians Go Home (1955). But the day following the sighting, the local reporters started to call the creatures "little green men" and the words were soon reproduced in many newspapers, quoted on the radio, and translated into other languages). According to the book Comedy-Horror Films: A Chronological History, 1914–2008 by Bruce G. Hallenbeck, the 1986 movie Critters is loosely based on the Kelly-Hopkinsville case. The Kelly–Hopkinsville encounter was the basis for the Annoyance Theater's musical "It Came From Kentucky" in Chicago. Joe Nickel interview about the Kelly–Hopkinsville encounter on the podcast Monster Talk: Episode 137: American Goblins—Part 2..
^ a b Schmaltz, Rodney; Lilienfeld, Scott O. (April 17, 2014). "Hauntings, homeopathy, and the Hopkinsville Goblins: using pseudoscience to teach scientific thinking". Frontiers in Psychology. 5. doi:10.3389/fpsyg.2014.00336. PMC 4028994. PMID 24860520. ^ Offut, Jason (2019). Chasing American Monsters. Minnesota: Llewellyn Publications. pp. 113–114. ISBN 978-0-7387-5995-1. ^ a b c d e f Dunning, Brian. "Skeptoid #331: The Kelly-Hopkinsville Encounter". Skeptoid. Retrieved June 26, 2013. ^ "Story of Space-ship, 12 Little Men Probed Today". Kentucky New Era. August 22, 1955. Retrieved March 31, 2010. ^ Leclet, Renaud (2008). "Que cache les entités de Kelly-Hopkinsville ?". Plaquette du Cnegu. ^ a b Clark, Jerome (1993). Unexplained! 347 Strange Sightings, Incredible Occurrences, and Puzzling Physical Phenomena. Detroit: Visible Ink Press. ISBN 0-8103-9436-7. ^ Hendry, Allan (1980). Ronald Story (ed.). The Encyclopedia of UFOs. Garden City: Doubleday & Company, Inc. pp. 190–92. ISBN 0-385-13677-3. Archived from the original on September 27, 2007. ^ Lagrange, Pierre (2005), « Les petits hommes verts débarquent ! » (Little Green Men Have Landed! ), L'Histoire n° 304, décembre 2005, pp. 26–27; Lagrange, Pierre (2016), « Qui croit aux petits hommes verts? De l’iconoclasme sociologique aux cultures visuelles. » (Who Does Believe in Little Green Men? From Sociological Iconoclasm to Visual Cultures), in Gil Bartholeyns (dir), Politiques visuelles, Paris, Presses du Réel, 2016, pp. 229–271. ^ Kidder-Mostrom, Christopher (August 23, 2015). "Review: It Came From Kentucky/The Annoyance Theatre". Newcity Stage. Retrieved March 31, 2019. This page was last edited on 3 April 2019, at 18:28 (UTC).